You are right! 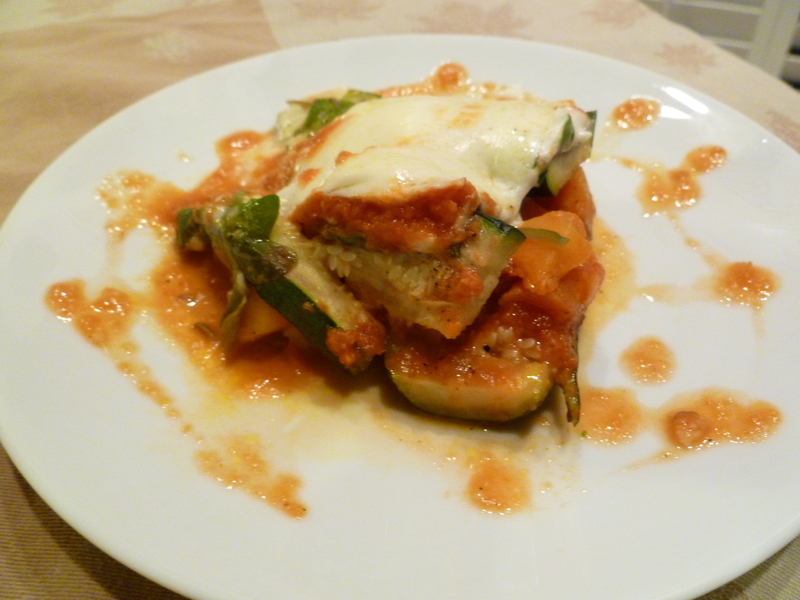 lasagna is not a typical Brazilian food but like any other country, Brazil loves Italian food. Many Italians immigrated to Brazil from as early as the 19th Century after suffering economical crises in Europe with the Industrial Revolution, mostly were agricultural workers without land that immigrated to Brazil to work on its coffee plantations . Many ships left the Port of Genoa (Italy) and arrived at the Port of Santos ( Brazil). Brazil is today home for one of the largest community of Italians outside Italy. Anyway, enough with History and back to the dish. I love this recipe because it has no noodles, it is low carb and absolutely delicious, easy to prepare and scrumptious! 6 large zucchini sliced lengthwise, about 4 slices per zucchini. 4 large red bell peppers sliced lengthwise , about 4 slices per bell pepper. 1 small butternut squash diced ( cut into very small pieces). 3 carrots diced ( cut into very small pieces). 3 cups of fresh spinach. 3 apples, skinned and diced. 2 celery stalks finely chopped. 4 ripped Roma tomatoes diced. 1 can 28oz organic crushed tomatoes. 1 cup crumbled feta cheese. 1/2 pint half and half cream. 3/4 cup shredded Asiago cheese. Place zucchini slices on a large baking sheet, drizzle olive oil and sprinkle salt and flour over them.Set aside. Place red bell pepper slices on another baking sheet, drizzle olive oil and sprinkle salt. Set aside. Place butternut squash and carrots on another baking sheet, drizzle olive oil and sprinkle salt. Set aside. Place zucchini on top rack of the oven and red peppers on the bottom. Roast them first for 20 minutes. Remove from oven and set aside. Then roast squash and carrots for 20 minutes . Remove from oven and set aside. Keep oven heated to 350F. While vegetables are roasting and resting aside. prepare the sauces. Heat 2 tbsp olive oil in sauce pan, add diced tomatoes, apples, celery, shallots and garlic. Let it cook until all are soft. Add can of crushed tomatoes and smooth sauce with a hand mixer. If you don’t have one , use a blender. Add fennel seeds and salt to taste, let it cook over medium heat until bubbly then reduce heat and let it cooking. Dissolve corn starch in cold milk, then transfer to a sauce pan, add half and half, salt to taste and nutmeg, stir constantly until thickened. Remove from heat and add half of the Asiago cheese, stir and set aside. Place one layer of sliced zucchini on the bottom of a large Pyrex or ceramic rectangular dish. Pour all the roasted butternut and carrots on top. Pour half of the tomato sauce on top. Make a second layer with the sliced roasted red peppers. Put all the fresh spinach and fresh basil leaves all over. Sprinkle all the feta cheese o top. Drizzle with olive oil. Pour all the white sauce on top. Then make a final layer with the rest of sliced zucchini. Pour the rest of the tomato sauce on top. Place the fresh mozzarella slices all over. Sprinkle the rest of the Asiago cheese on top. Drizzle with more olive oil and place it in oven for 30 minutes. 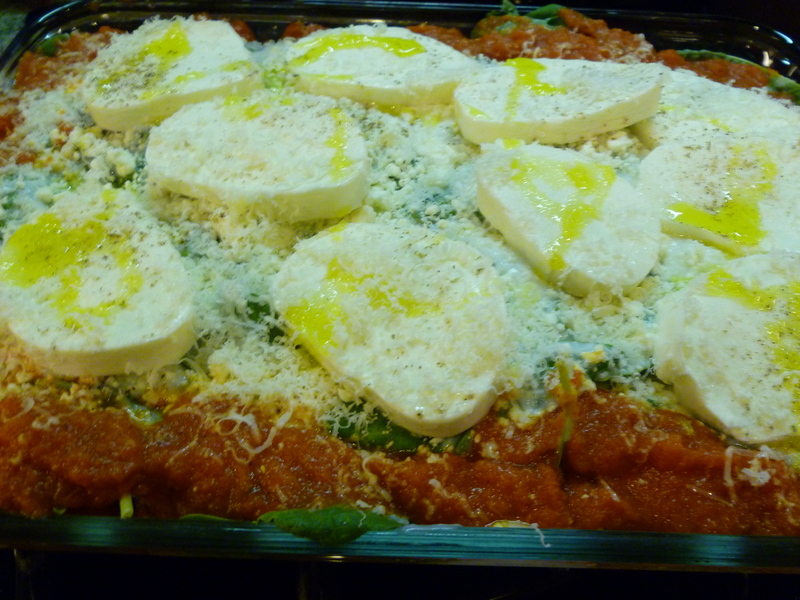 Remove from oven and let set aside for about 10 minutes before serving. Enjoy! oh! and by the way, it is even better the next day!